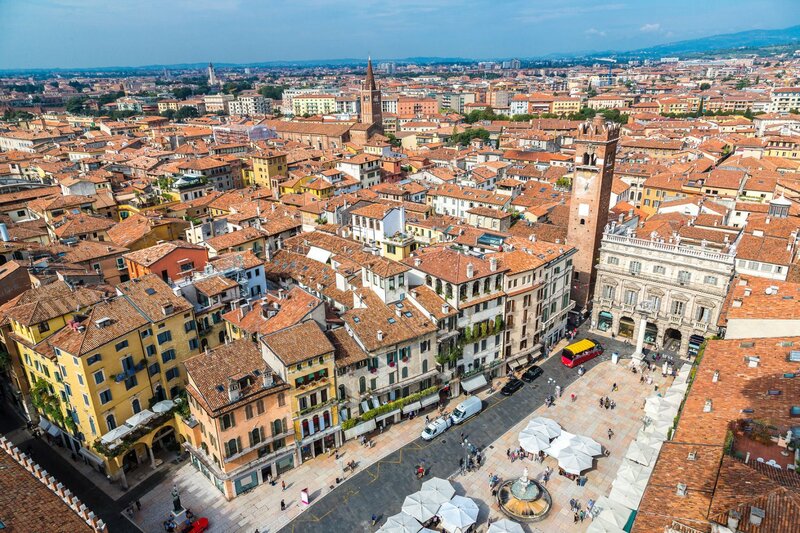 In fair Verona travellers can find a wealth of things to do. Known most prominently as the home of Romeo and Juliet, this city has frequently been nicknamed the city of love. Not just that, it has also been referred to as the gateway to Italy, as it shows those travelling from the north the true essence of the country to follow. Perfect for a romantic city break you can explore the medieval alleyways and roman architecture and sample the city’s delicious food. 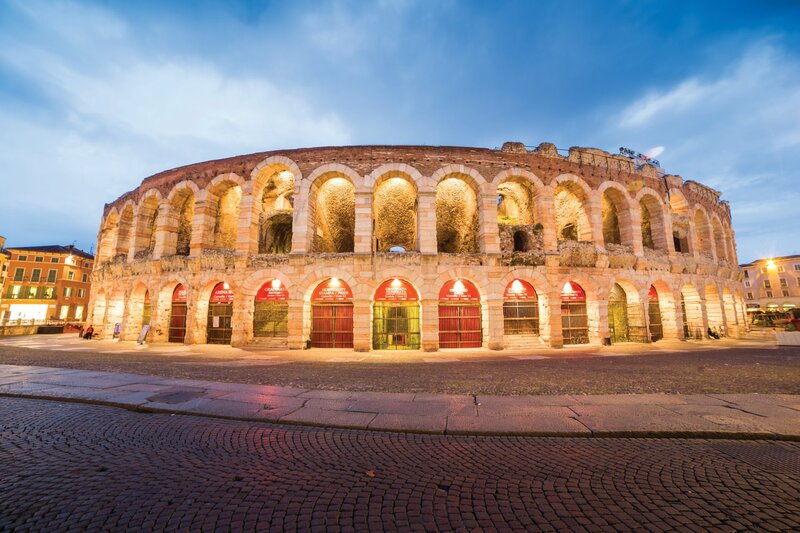 Top of the list, the roman amphitheatre can’t be missed. Built in the first century it is still functional today. It is said to have accommodated nearly 30,000 people and hosted traditional gladiator shows but today it hosts the city’s summer opera festival. Situated in the old town centre prices for entry are usually €10. You can visit the arena from 8.30am – 7.30pm Tuesday – Sunday (in busier months it also opens on Mondays). We may not know if the lovers Romeo & Juliet existed but we know the families certainly did. Montecchi & Cappelletti were feuding political families from the 1300’s. 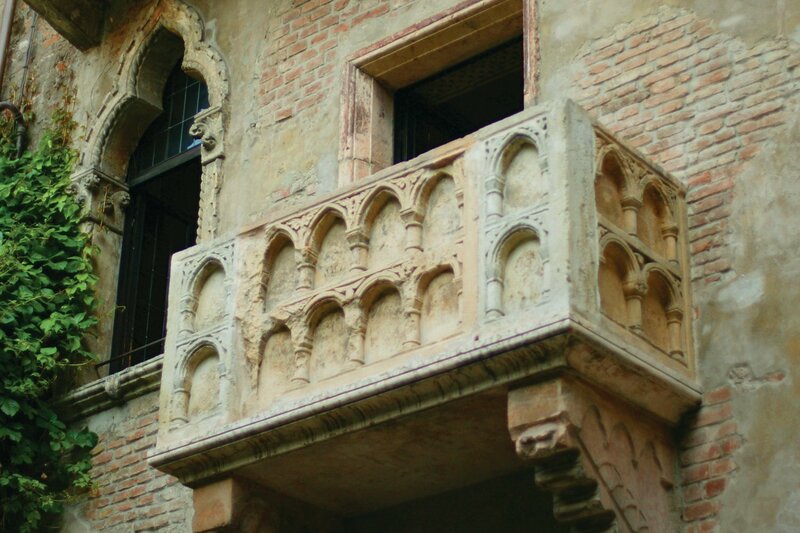 Visit the house which belonged to the ‘Capulet’ family and stand on Juliet’s balcony. Enter the museum and discover the historic reality behind the tragic love story. Most tourists visit the courtyard where thousands of love messages pattern the walls and rub the chest of Juliet’s statue for good luck in love. Entry to the museum is €6 but the courtyard is free. Located in the city centre the museum is open 8.30am – 7.30 pm Tuesday – Sunday and 1.30pm – 7.30pm on Mondays. At the heart of the city Piazza delle Erbe is a delightful market square. Hosting a popular market, you can purchase fresh fruit and vegetables as well as clothes and souvenirs. On an evening the square is the perfect place for an aperitif or to just sit and enjoy the buzz around the little café’s and bars. The square is adorned with pretty and historic buildings and surrounds the beautiful fountain Madonna Verona. Just outside the square the iconic bell tower ‘Torre Dei Lamberti’ gives way to spectacular city views where you can also admire statues of the Roman gods at Baroque Palazzo Maffei. Located in the city centre the market is most popular on Saturdays and Sundays. Flowing through Verona the Adige River is the second longest in Italy. 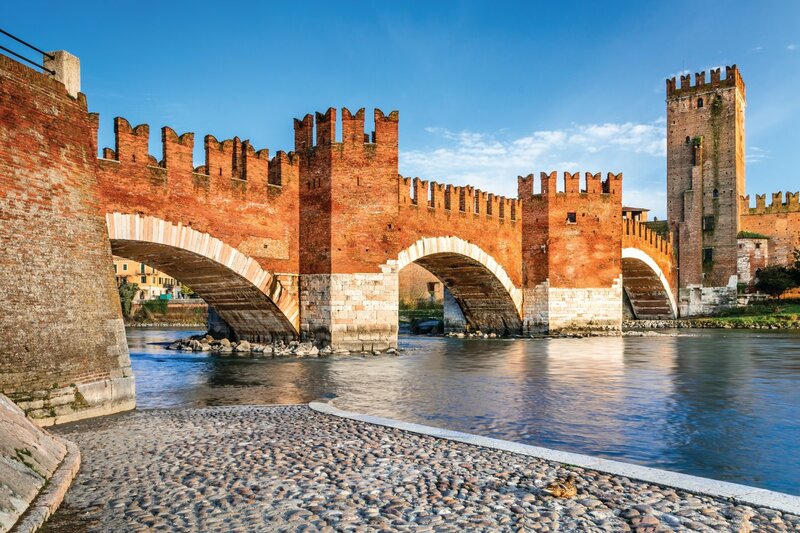 One of the best things to do in Verona is leisurely walk along the river and witness the six main bridges connecting the main part of the city; Ponte Pietra, Ponte Scaligero, Ponte della Vittoria, Ponte Nuovo, Ponte delle Navi and Ponte Garibaldi. With a colourful history most of the bridges have been damaged and rebuilt in some way but the traditional architecture remains. The two most popular to visit are Ponte Pietra and Ponte Scaligero. Ponte Pietra is the oldest bridge, built to provide access to the amphitheatre. Ponte Scaligero is a fort style bridge connected to Castelveccio, it was built to provide a safe escape from the castle. Perfect for pictures the bridges are easy to access from any part of the city. Slightly out of town Giardino Giusti is a palace with beautiful gardens. Situated 84 metres high above the city, the views are breath-taking. 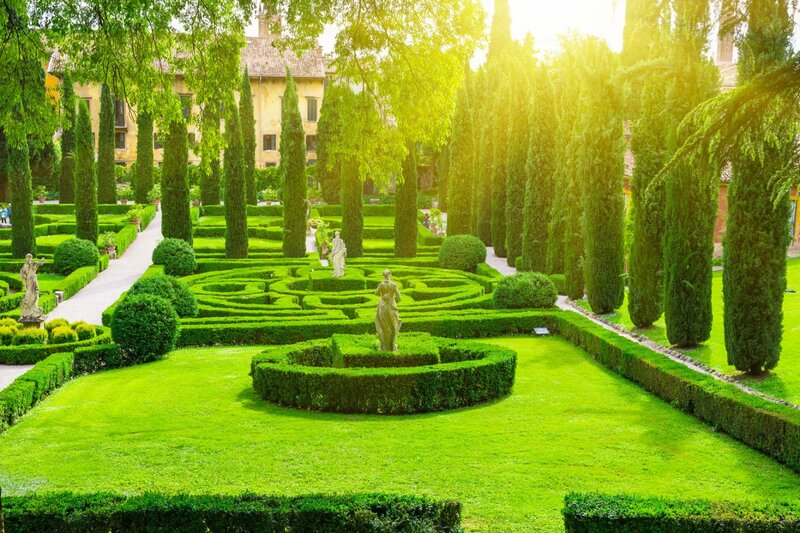 Built by the Giusti family in the 1400’s the gardens are peaceful and relaxing. It is said Mozart himself visited the gardens for inspiration. Take a picnic or enjoy the café with a terrace overlooking the city. Open April – September from 9am – 8pm and October – March 9am – 7pm. Prices are €8.50 in high season but free to children under 11. Travelled to Verona before? We’d love to hear what you love about the city. To talk about tours and excursions or to book your next Italian adventure, speak to our specialist Italy team on 0800 294 9322 or find out more about Italy here.